<time-to-live> How long the directive is valid. Can be specified in minutes, hours, and days, e.g. 30m, 4h, 2d. Valid units are [smhd]. "never" indicates a directive that never expires. If unspecified, the directive never expires. <path> List only cache directives with this path. Note that if there is a cache directive for path in a cache pool that we don't have read access for, it will not be listed. 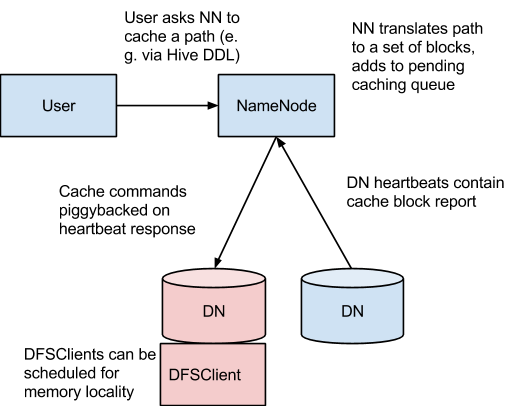 In order to lock block files into memory, the DataNode relies on native JNI code found in libhadoop.so. Be sure to enable JNI if you are using HDFS centralized cache management. This determines the maximum amount of memory a DataNode will use for caching. The "locked-in-memory size" ulimit (ulimit -l) of the DataNode user also needs to be increased to match this parameter (see below section on OS Limits). When setting this value, please remember that you will need space in memory for other things as well, such as the DataNode and application JVM heaps and the operating system page cache. If you get the error "Cannot start datanode because the configured max locked memory size... is more than the datanode's available RLIMIT_MEMLOCK ulimit," that means that the operating system is imposing a lower limit on the amount of memory that you can lock than what you have configured. To fix this, you must adjust the ulimit -l value that the DataNode runs with. Usually, this value is configured in /etc/security/limits.conf. However, it will vary depending on what operating system and distribution you are using. You will know that you have correctly configured this value when you can run ulimit -l from the shell and get back either a higher value than what you have configured with dfs.datanode.max.locked.memory, or the string "unlimited," indicating that there is no limit. Note that it's typical for ulimit -l to output the memory lock limit in KB, but dfs.datanode.max.locked.memory must be specified in bytes.